Throughout our quest to visit all of the US national parks, we’ve visited a few where we were prepared to be underwhelmed. However, each time, we’ve been thrilled to discover a new place that is beautiful and interesting. 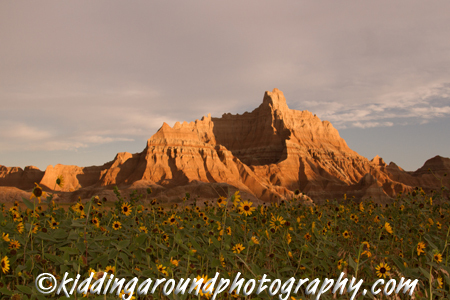 South Dakota’s Badlands National Park was one of these pleasant surprises! We visited Badlands on our cross-country road trip in the summer of 2013. On that trip, we also explored Wind Cave National Park, Theodore Roosevelt National Park, and Mount Rushmore National Monument. We weren’t exactly sure what to expect, but Badlands easily surpassed whatever expectations we had! We did see bison, bighorn sheep, and prairie dogs (Jeff’s favorite) in the park. They live in largest protected expanse of mixed grass prairie remaining in the entire country. One of the things that makes Badlands so beautiful is its diversity. In one area there’s that mixed grass prairie, and in another area there are rolling mounds covered with green grasses, and then you come across completely dry, barren hills striated in ten different shades of tan. Another thing that makes this park beautiful is its expanse of sky. We saw an incredible thunderstorm there which ended with an amazing sunset. And the next morning we awoke to a gorgeous sunrise striking the hills over a field of sunflowers while deer grazed along the edge! Does this sunset photo not look like Michelangelo painted it? We thought for sure a storm was a comin’, but it never happened. Sunrise – yes, I was up! There is lots of hiking to be done in this park, including this fun and crazy hike where you have to climb ladders to get up the rockface and to the end of the trail. Other trails crisscross the beautiful hills and prairies. The main park road runs east-west, just above The Wall, a 60-mile long escarpment separating the Upper and Lower Prairies. Numerous turnouts offer information, wildlife viewing, and overlooks of the highly eroded landscape between the two levels of prairie. 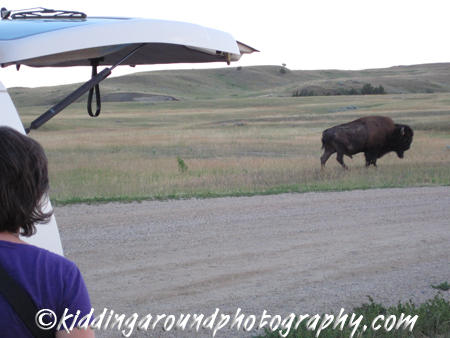 This bison was a little too close for comfort! Remote and rustic Sage Creek Campground offers a panoramic view and a few basic campsites in the midst of the prairie. We watched several bison wander through the area, and one even walked within steps of our campsite! 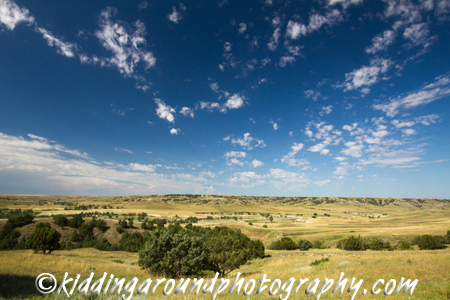 Also on the unpaved western end of the park road, Roberts Prairie Dog Town offered great prairie dog viewing. The paved portion of the road begins a bit farther east, at the Pinnacles entrance which is due south of the town of Wall (home of the famous Wall Drug shopping and tourist extravaganza — well worth a visit, at least for its ice cream and free water!). The more-visited eastern end of the park hosts a visitor center, gift shop, lodge, restaurant, and Cedar Pass Campground, which also has a panoramic view and is suitable for RVs. We wandered from our campsite over to the nearby visitor center for sunrise. A bit farther north, the Cliff Shelf Nature Trail offered an easy loop hike with some good birding spots. While it may not be a destination park along the lines of Grand Canyon or Yellowstone, Badlands is well worth a visit considering its geology, wildlife (including birding opportunities), hiking, car-friendliness, size, backcountry, campgrounds, and especially its proximity to other worthwhile sites including Wind Cave National Park, Mount Rushmore, Deadwood, Custer State Park, and, yes, even Wall Drug! Which travel destinations have provided you with pleasant surprises and great memories? Enjoy your week or your weekend! I got married in Dec and we honeymooned in Shenandoah and now I want to hit all the NPs too!! Very cool blog, I’ll have to read more. I saw you need to do Florida parks still and I am trying to plan a 2015 trip at Everglades and Biscayne then drive to key west and take the boat to Dry Tortugas NP. Thanks for the inspiration! Dry Tortugas is one of our favorite parks. Sometimes the campground there is open, and it’s an amazing experience to stay overnight there! Shenandoah is one we’ve never been to – am itching to go! Thanks for the follow 🙂 Enjoy your week or your weekend!